The Knights extend their nation-best win streak to 24 games despite losing McKenzie Milton to an injury early in the game. TAMPA — Like most sequels, the 2018 version of the “War on I-4” couldn’t replicate the instant classic USF and UCF staged last November. Not even close. 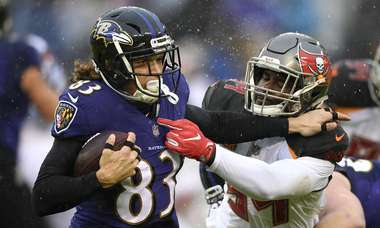 The high stakes and high scoring of the 2017 thriller were absent Friday afternoon at Raymond James Stadium. The mesmerizing ebb and flow of last year's game, rife with offensive haymakers and subsequent counter punches, never really materialized. And instead of a heart-stopping finish, an announced crowd of 57,626 was exposed to a stomach-turning casualty. By the anticlimactic end to this 38-10 Knights triumph, the line of demarcation separating the winners from the losers seemed blurred. Read Joey Knight’s full story here. UCF runs out the clock on its 24th consecutive victory. Oladokun goes down again, at the 2. It’s now 4th-and-32. T O U C H D O W N T A J!! And McGowan picks up the final four yards on a run up the middle. UCF extends its lead to 38-10 with 2:51 to go. McGowan now down to the 4 after a 20-yard gain. Taj McGowan up the middle for 12 yards. McCrae stopped after a short gain but somehow stays on his feet and gains 13 yards. Darriel Mack appeared to be stopped short of a first down but lunges forward to pick it up at the UCF 46. Another near-pick, and USF will have to punt. Kyle Gibson nearly picks off Chris Okadokun on an attempted pass to Tyre McCants. On third-and-8, Mack finds Snelson (got behind secondary) for 47 yards. McCrae follows with 31-yard TD. #UCF up 31-10. This one's in the books. SERIOUSLY HIS SHOES ARE ON 🔥‼️@NikeheadGreg sends Ray Jay into a frenzy with his THIRD touchdown of the game to cap an 80-yard 53-second drive! And there’s McCrae again, busting loose for a 31-yard touchdown run, making it 31-10 UCF with 9:17 to play. UCF goes back to the deep ball, as Mack connects with Dredrick Snelson for a 47-yard gain. Mack overthrows Tre Nixon, who was open on a deep pattern. Bulls punting on fourth-and-1 at their 43, eliciting the heartiest chorus of boos I've heard at a #USF home game this year. Pat Jasinski stacks up Bell for no gain, and USF will have to punt. Joey Connors stuffs Okadokun after a gain of 1, and it’s 3rd-and-1. Duran Bell with an 8-yard gain to the USF 42. USF stops Darriel Mack short of the line to gain on fourth down, and UCF will have to punt from deep in its own territory. Bulls defensive back Mazzi Wilkins is down on the play. And just like that, UCF restores its two-touchdown lead, as Greg McCrae goes 39 yards for a touchdown. Knights lead 24-10 with 13 seconds left in the third. Johnny Ford takes a short pass 35 yards for a touchdown, and USF is now within 17-10 1:15 remaining in the third quarter. Chris Oladokun back under center for USF. That's three consecutive punts for #UCF. For the second game in a row, the #USF defense is playing well enough to win. Kean dropped for a huge loss, and it’s now 4th-and-21. Bulls will punt. Kean had St. Felix absolutely quarantined behind the #UCF secondary, and overthrew him. You only get 1-2 of those chances a game. It's imperative to capitalize on them. Kean overthrows wide-open Randall St. Felix downfield, and it’s 3rd-and-6. Mack chased out of the pocket on 3rd-and-4 from the UCF 39, and the Knights will punt. Watching this USF offense, I'm fairly certain that UCF, with a 17-3 lead and still 10:05 left in the third quarter, already has enough points to win this game. USF is going to need to a defensive or special teams score at some point, I think. Kean overthrows Randall St. Felix on 3rd-and-9, and USF will have to punt. USF out to its 38 on a 4-yard completion to Mitchell Wilcox. Tyre McCants makes a fair catch at the USF 7. McCrae stopped after a short gain on 3rd-and-11, and UCF will punt. Greg McCrae picks up a UCF first down at midfield. TAMPA — Less than 20 minutes into the “War on I-4,” both projected starting quarterbacks already had been lost for the game. Knights junior McKenzie Milton, a fringe Heisman candidate who has guided the No. 8 Knights to a 23-game win streak, was carted off the field with what turned out to be a dislocated knee with 11:17 to play in the first half. Milton remained on the ground near the Bulls sidelined after being tackled by Bulls CB Mazzi Wilkins following a 5-yard gain. Fourth-down pass is incomplete, and USF gets the ball back with 21 seconds left in the half. Mazzi Wilkins breaks up a third-down pass, bringing up 4th-and-6 for UCF from the USF 37. And there’s Mack again, picking up 13 yards and another first down. Mack scampers to the 47 for another first down. Gabriel Davis pulls in a slant pass from Darriel Mack, and UCF has a first down at its 35. Coby Weiss' 25-yard FG ends #USF scoreless skid that had stretched to late in 2nd quarter of Temple game. #UCF leads 17-3 with 3:09 to play in half. Coby Weiss' 25-yard field brings USF back to within 17-3 with just over 3 minutes left in the half. Slant pass for Tyre McCants is incomplete, and USF faces 4th-and-5. Couple of big runs by Johnny Ford, including a 38-yard pickup, and USF is down to the UCF 13. Greg McCrae goes right up the middle for a 40-yard touchdown. The Knights cover 70 yards on just four plays, all runs, and lead 17-0 with 5:01 remaining in the half. Brett Kean nearly intercepted by Kyle Gibson, but the pass falls incomplete. UCF punts, but Tyre McCants is tackled inside the USF 10-yard line. Darriel Mack in at quarterback for UCF. USF goes three-and-out and will be forced punt from deep in its own territory. UCF extends its lead to 10-0 on Matthew Wright’s 42-yard field goal with 11:01 left in the half. Awful sight at USF-UCF game. UCF QB McKenzie Milton suffers what appears to be a serious injury to his leg. Entire team surrounding him and cart on the field. They're already bringing the cart out for McKenzie Milton. McKenzie Milton sprints right on 3rd down and is stopped well short of a first down. Milton is down on the play with what is being called “a serious leg injury." Milton overthrows Tre Nixon, but USF’s Mazzi Wilkins penalized for pass interference, giving UCF a first down at the USF 33. Greg McCrae with a gain of 13, and UCF is out close to midfield. Joey Connors with a fourth-down stop on Cronkite, and UCF regains possession. Tyre McCants stopped two yards short of the first down, setting up 4th-and-2 from the 35. Kean brought down for no gain. Jordan Cronkite picks up a USF first down with a 3-yard run up the middle on third down. Brett Kean replaces Chris Okadokun at quarterback for USF. After Bulls fail miserably inside the Knights 10, #UCF responds with 10-play, 97-yard scoring drive. You kinda could see it coming after Bulls were stuffed on fourth-and-1. 97-yard drive capped by a Gabe Davis TD!! And there’s Davis again, over the middle for 14 yards and a touchdown, capping a 10-play, 97-yard scoring drive. UCF leads 7-0 with 25 seconds remaining in the quarter. Gabriel Davis with a great catch along the sideline to move the ball to the USF 14, a 38-yard gain. Adrian Killings finds some running room up the middle, and UCF is near midfield. Jake Hescock’s eight-yard catch gives UCF another first down. Milton hits Gabriel Davis for a first down on 3rd-and-5. Jordan Cronkite stopped a yard short of the first down. UCF takes over on downs. A spinning Ford is wrapped up short of the first down, bringing up 4th-and-1 from the 3. Johnny Ford carries to the UCF 6. Nick Roberts picks off that high McKenzie Milton fastball. Bulls in business at #UCF 12. And now Milton throws an interception! USF’s Nick Roberts returns it to the UCF 12. McKenzie Milton throws incomplete, and it’s quickly 3rd-and-4 for UCF. Oladokun floated/telegraphed that downfield 3rd-down throw, picked by Richie Grant (his FIFTH of the year). And just like that, a promising #USF drive ends. Oladokun pass down the sideline picked off by Richie Grant at the UCF 17. USF now facing 3rd-and-5 from the UCF 38. Backwards pass to Duran Bell hits the ground, but Bulls manage to recover. Oladokun hits Ryeshene Bronson for a first down to the UCF 42. Slant pass to Tyre McCants good for only a few yards, and it’s 3rd-and-6. Jordan Cronkite picks up the first down. Oladokun’s pass to Wilcox short of the first-down marker, bringing up 3rd-and-1. Oladokun hits tight end Mitchell Wilcox for 17 yards and a first down at the USF 32. McKenzie Milton throws incomplete for Tre Nixon. Knights punt the ball back. UCF faces 3rd-and-11 from the Bulls 34. UCF quickly moving downfield as Greg McCrae runs twice for 20 yards, Adrian Killins pulls in a McKenzie Milton pass for 18. Oladokun stopped for no gain on 3rd-and-9, and USF will have to punt. USF junior QB Blake Barnett is not suited up for today’s showdown against UCF, the second time in three games he has been sidelined by an injury. Third-year sophomore Chris Oladokun, a Sickles High alumnus, is expected to make his second career start today at Raymond James Stadium. Kickoff is at 4:15 p.m.
Barnett, third in the American Athletic Conference in total offense (280.6 ypg), injured his ankle in the second quarter of last week’s 27-17 loss at Temple, but completed the game. He also re-aggravated a shoulder injury that kept him sidelined for the Bulls' loss at Cincinnati two weeks ago. On a more positive note, a crowd of roughly 58,000 expected today at @RJStadium. That would be capacity for the way the place is configured today (west side of upper level open). More than 10,000 #USF student tickets were requested. We were warned. Now the pirates are here. Stay with tampabay.com all day for live reports. 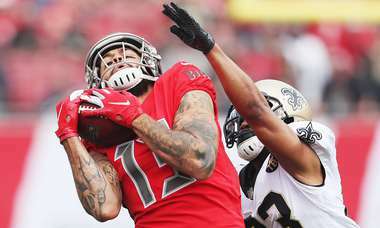 Two Jameis Winston fumbles, one returned for a touchdown and another deep in Buccaneers territory, leads to a third consecutive loss, dropping the Bucs to 5-10. With quarterback Lamar Jackson leading the way, Baltimore rushes for 242 yards today at M&T Bank Stadium to drop Tampa Bay to 5-9. Trailing 14-3 at halftime, New Orleans scores 25 unanswered points in the second half to drop Tampa Bay to 5-8. One month after a 14-point defeat in Charlotte, N.C., the Buccaneers turn the tables on the Panthers in Tampa. 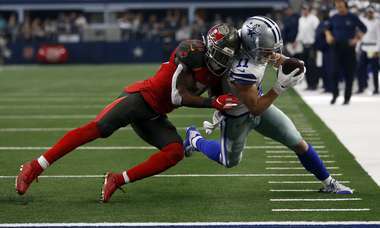 Jameis Winston and the Buccaneers play largely mistake-free football in winning for the second time in nine games.